Behind every lovely bride is a team of friends and family supporting her at every step along the aisle. The result was a dreamy mermaid-inspired brunch by the sea followed by a bridal session that embraced these ladies' fantastic friendship. We've got new #squadgoals after seeing the pics from Ashton Kelley Photography! Just a day before Brittany and Andy's wedding, maid of honor Rachael decided that she, the bride, and their two closest friends had time for one more wedding related surprise. After Brittany had been out and about tying up loose ends for her ceremony the next day, she met Rachael back at their hotel rooms: there, "[Brittany] found her wedding dress, pink tulle skirts, complimentary jewelry, make-up bags, and curling irons," says photographer Ashton Kelley. The wedding dress that had been placed in the hotel room was even one that Rachael had found on a bargain sale, so Brittany could frolic and play on the beach in the beautiful gown without worrying about messing up the actual gown she'd wear for her wedding. 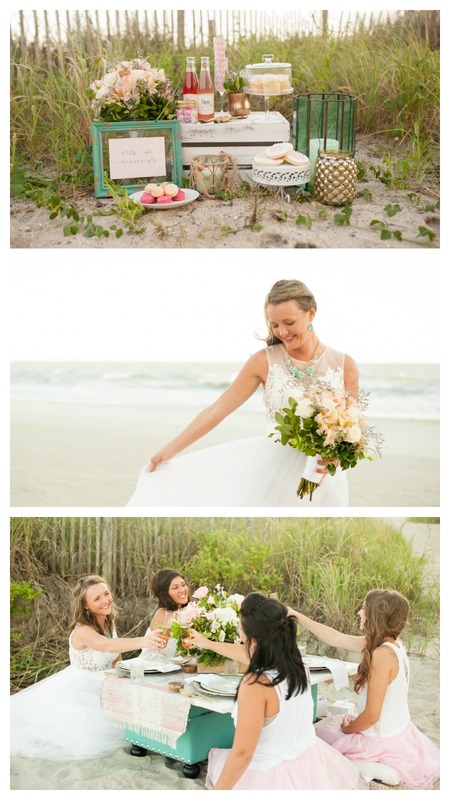 As their photographer snapped photos of the four friends, the group sat down at a beautifully designed table right on the beach to indulge in some scrumptious snacks. "The snack brunch included french macaroons, flavored fizzy sodas, and designer cookies," remembers photographer Ashton. The picture perfect setting was complete with well wishes and champagne toasts from all of the ladies. Ater the ladies had had their fill of drinks and snacks, they made use of the beautiful beach setting to grab some last minute bridal portraits of Brittany. Rachael and the bridesmaids had thought of every detail and even had special bouquets made for the bridal session. Each bouquet was slightly different to showcase the personalities of each person, but all of the arrangements were linked thanks to their color scheme and flowers. Brittany and her maids posed barefoot for photos in their flowing skirts for the ultimate in relaxed beach bridal portraits. What a way to create memories in the last hours before saying "I Do!"